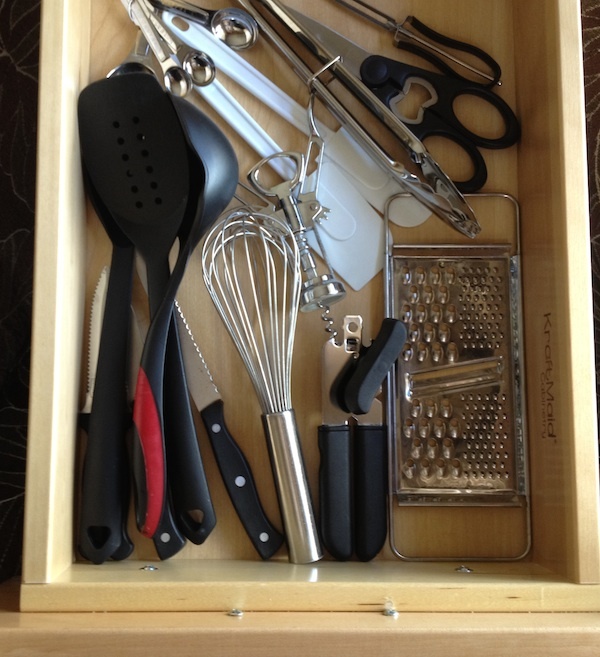 If you’re moving into your first apartment, you may be wondering what tools you really need to have in your kitchen drawer. There are many, many handy dandy cooks tools available and if you walk into a specialty shop or just turn down the cooks tools isle at your local department store you may be quickly overwhelmed. Or, if you’re on the other end of the spectrum and you have a drawer full of tools that you never use then you may want to check out these lists too as you think about downsizing. It might be time to de-clutter your drawer and this list may help to sort things out so you can see what you should keep and what items should find another home. So, here’s a list of the items that you really should have in your kitchen drawer if you intend to cook for yourself. You will probably add to your collection over time, but until you become a culinary expert these tools will let you do most anything that needs doing in the kitchen. Can Opener A simple one that turns easily is all you need. An electric one that takes up precious countertop real estate is really not needed. Most cans are now flip-tops anyways. Wine Corkscrew Even if you don’t drink wine, you should pick up a cheap wine opener. Wine makes a nice housewarming gift, so someone is bound to bring you a bottle sooner or later. Rubber Scrapers Whether you bake or just need to get to the bottom of the mayonnaise jar, rubber scrapers come in handy. A large one and a narrow tiny one should be sufficient for most any scraping job. Meat Thermometer The easiest way to tell if your meats are cooked properly. Grater Whether you’re grating vegetables for salads or cheese for pasta, a grater comes in handy. Paring Knife A small sharp knife is used all day in the kitchen. Steak Knives Even if you don’t eat meat, a few of these come in handy for cutting most anything. Serrated Knife A large serrated knife is needed to slice fresh bread and other delicate items. Measuring spoons A basic connected set with 1/4, 1/2, 1t & 1T is perfect for baking or any recipe. Measuring Cup Either a one cup measure if you don’t do much baking or a set of connected cups (1/4C, 1/3C, 1/2C, 3/4C, 1C) if you are a baker. Vegetable Peeler Peeling vegetables is extremely difficult without one of these. Tongs Make it much easier to grab large foods like corn on the cob out of boiling water. Slotted Spoon When you want to leave the liquid behind. Spatula For turning most anything you cook on the stove. Large Spoon For stirring, get plastic if you use non-stick pans and go with stainless steel if you opted for stainless steel cookware. Ladle For serving soups and stews. Scissors A good pair of cooking scissors can not only cut open any packaging, but will also cut through meats and vegetables with ease. Some tools though, if you’ve already got them, may deserve a second chance and be more useful for a different purpose.